What is a typical hot air balloon flight? You will normally meet shortly before dawn for a morning flight. This is because the wind is the most calm in the early morning. The wind is the most important factor when it comes to a balloon ride as the weather may seem fine early on in the day but wind speeds can change dramatically and this can mean the flight can be cancelled. Due to weather conditions hot air balloon flights are sometimes cancelled at the last minute, requiring the flight to be rescheduled. Although this can be somewhat frustrating it is worth it when the flight finally goes ahead. There is nothing quite like riding in a hot air balloon! The pre-flight setting up of the balloon is just as spectacular a show for the passengers as the actual flight itself as they are able to witness the impressive sight of the envelope being fully inflated. The envelope is laid out flat and stretched out on as much land as possible. An inflator fan is placed at the throat of the balloon and it starts to fill up with air. The basket is then attached to the envelope and the burner secured in place. With the balloon now full of air the burner can be fired up and the cool air in the balloon is heated to stand the balloon up. The basket is constantly secured to the ground throughout this whole process, to make sure that the balloon doesn't just take off with an unexpected wind gust. Once the envelope is standing upright and the pilot is ready the passengers make their way into the basket. Once everyone is informed about the safety of ballooning and the pilot is ready and clear for launch, your balloon pilot will put enough heat into the balloon and it will begin to slowly rise off the ground. Congratulations you are aloft. It's hard to describe the feeling of flying in the balloon, it's almost like a feeling of weightlessness, as if you are drifting along, floating on air. On a clear day you will be able to see for miles. The hot air balloon flight lasts for about 1 hour in total before the pilot will start looking for a safe place to bring the balloon in to land. The pilot will bring the balloon down at a very slow rate and the crew will be there to ensure that you land as softly as the winds allow. After everyone is safely out the envelope is then deflated and the crew will pack it back up. The basket and now packed up envelope are then secured on to the van. All the passengers are then offered champagne mimosa and a traditional light brunch. The hot air balloons flown by American Balloons are state of the art, registered aircraft, certified by the Federal Aviation Administration and inspected and maintained in accordance with FAA rules & regulations. . We are always working to provide our customers with the safest experience possible, therefore we do not keep equipment for more than 7 years. For your safety and comfort we work closely with our balloon repair station as well as the manufacturer to improve the standards of balloons not only for our company, but for the safety and comfort of others. Something comfortable, dress according to the outside temperature. The balloon temperature is about 7-10 degrees hotter than the outside air. Always wear tennis shoes or closed toed shoes. All of our pilots are certified by the FAA (Federal Aviation Administration) with commercial lighter than air flight instructor ratings. They are well versed in the structure of the balloon and its instruments. 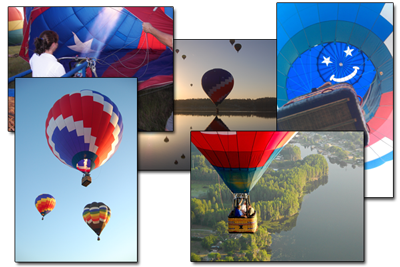 American Balloons carries aviation insurance that covers both property damage and personal injury. American Balloons has several different balloons allowing us to accommodate as little as two passengers on a sweetheart flight all the way up to 10 friends in one basket. If you are looking for a personal experience with your love, please make sure you call ahead to book that private experience with our staff. If you have a larger group than 10 we will take more than one balloon so you can take pictures of each other in the sky! Hot air balloons usually do contour flying just above the tree tops, however we are at the mercy of the wind. Most times you will find different wind directions at different altitudes that will allow us to change the directions that we are heading. Every flight is different. Our maximum altitude in the East Pasco area that we fly in is about 3000 feet. At different altitudes the winds are blowing different directions we change our altitude and use the winds to steer the balloon the direction we want to go. Please feel free to bring you video equipment and/or camera all pictures are welcome. Please remember there is a limited amount of space in the basket and that you are ultimately responsible for your equipment. We recommend that you make reservations at least two weeks in advance. Weekends are the most popular days to fly and they can fill up fast. Yes, we accept most major credit cards. Reservations require a $25 per person deposit and the balance will be due on the morning of your flight. If you wish to discuss other options please feel free to contact the office directly. Yes gift certificates are available. Gift Certificates are valid for 2 years from month of purchase unless otherwise stated. Gift certificates that are used after expiration date may be subject to additional charges of $25 per month. Gift Certificates are great for that special someone that has everything. If you are looking for a certificate for someone out of state, We can help you with that also! Your price includes a hot air balloon ride with a professional certified pilot, experienced crew to inflate and pack up the balloon, a traditional champagne toast and breakfast after your flight. Couple flights also include a keepsake champagne flute. Don't Forget that Special Someone on their Birthday or for a Memorable Anniversary. Our Meeting Location is the Hampton Inn and Suites Lobby, 2740 Cypress Ridge Blvd, Wesley Chapel, FL. Click here for directions We will forward you a map upon booking to help you get to us easier. You can contact them for special Balloon Rates if you wish to stay the night. American Balloons has been flying over the East Pasco and North Hillsborough area for 20 years. We like to fly over New Tampa, Lutz, Land O Lakes, Wesley Chapel, Zephyrhills, Dade City and San Antonio. If the winds allow we also fly in Trinity and up towards Masarkytown. Mother Nature is our guide. What is the history of hot air ballooning?